How often did you hear that as a kid? 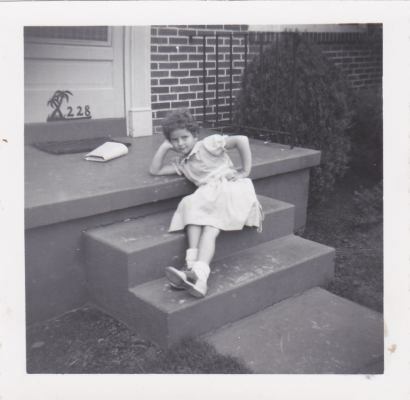 When I was a young girl about the age I was in this picture, people started asking me the question, “What do you want to be when you grow up?” I never hesitated even for a second. I always said I want to be a nurse, for no other reason than my Aunt Norma was one and I thought that she was very cool. Also, I loved my doctor and I watched Dr Kildare. What did I really know about nursing or what a nurse really did? But it looked very exciting and romantic on tv. Around the same time I started writing a novel. It was called “I Walk Alone” and was set in Paris. I was the lead character, of course, and also, of course I was beautiful, tall and fashionable. And had long straight hair. None of which I had or was in real life. I met a man(in my novel) and he was handsome, rich, famous and mysterious. And he lived in Paris. I have never met a man who was any of these things in my life with the exception of mysterious and believe me, that is not a good trait in a man for which you want to form a relationship. Ok, I have had a few boyfriends and a husband that you could call handsome or at the very least cute. I never finished the book. I found it recently as we were going through things in my parents home. I found all my writing materials. They were all in a box in my parents attic. My past desire and childhood dreams all together in one box. The children’s books I wrote when my kids were little. Books I had tried desperately to get published to no avail. I took a “Writing Children’s Literature” course and thought surely I was going to be the next Dr. Seuss. Sadly, the being “the next Dr. Seuss” thing never happened. My kids loved the stories and still talk about them to this day. So guess it was worth it. Sadly, life got in the way of my dream of being an award winning novelist, as life has been known to do. By this time, I had gotten divorced and 3 kids and as many jobs didn’t lend itself to much time for writing. But finding the box that day brought it all back. The hopes, the dreams..the book signings. I am finally writing now, some 50 years after that first novel I attempted to write. Not to be a best selling novelist or the next Dr. Seuss, but for me. I write because I love to write and because it fulfills something deep inside me that has always wanted to get out. I don’t know, maybe it’s a need to be “heard”. Really heard.. Growing up I don’t think my parents ever really listened to me when I talked or spoke of my dreams. In reality I don’t think they had the time or they just really didn’t know how. I have always tried to listen to my family and friends and even to just anyone who was talking to me. Maybe my ability to listen has given me the ability to write. I know I have a million stories inside me waiting to get out. And I am thankful I can finally do just that! As a side note, I am glad I didn’t become a nurse. I don’t think I would have been a good one.. I am not a fan of blood and gore and all the stuff that goes along with nursing..and honestly, white has never been my color. Why are we waiting for that magical “Someday”…..
Why do we wait to do the things we want to do? What is it that makes us think we have all the time in the world and that “maybe someday” we will actually do it? Maybe your “someday” thing is a trip to somewhere far away or just traveling this great country of ours. You constantly say I want to see the Grand Canyon or I am going to drive the California coast “someday”. I can honesty say I have visited most of the places in our country I have wanted to see, for the most part. However, I do still have a few things that remain on my bucket list. Sometimes it’s something we have always wanted to do, like play an instrument, learn another language, write the next great american novel. I want to do all of these things. I am so happy that I have finally have started to write, not sure if a novel is ever in my future, but I’m doing it. The piano, I’m sorry to say, is in the upstairs bedroom. It’s there waiting for that special someday when I decide to learn how to play. And by the way, Italian is a really hard language to learn. The saddest someday of all isn’t about places or things, it’s about people. Those very special people in our lives we love, our family and friends. Maybe we will call them, maybe we will visit them, maybe someday. They are very special to us and we really mean to see them more, but somehow life gets in the way and we put it off. Don’t. Sometimes someday never comes. This has been a priority of mine lately. I try and see or talk to the people I care about as much as possible. And I constantly let them know how much they mean to me. I’m sure most of you have a bucket list of things you want to do and places you want to go. I see some of my friends posts on Facebook, and they are going places and doing things and I am very happy for them. They are doing it, they aren’t waiting for the magical, mythical “someday”. Now, I know a lot of people will say, “I would, but I don’t have the money to do the things I really want to do”. But my answer is this…somehow, someway you can. You will find a way to make the things you really want happen. If there is one thing I have learned in this life, it’s that. What do you want to do? Where do you want to go? And what are you waiting for? When was the last time someone held the door for you? I don’t care if you are a woman or a man, if you are walking out and someone is behind you, it is common courtesy to hold the door for that person. I am actually shocked now when someone does it and it has become the rare occasion and is no longer the norm. Has anyone said thank you to you, with the exception of the cashier at the grocery store and they get paid to do it and even then sometimes don’t. What about, “excuse me” if they bumped into you by mistake? When was the last time a stranger smiled at you, if they happened to look up from their phone or the sidewalk as they walk along in their many journeys. I am very upset about all of this and feel people in general have gotten increasingly rude over the last few years. Granted, working retail has not helped with my view of the situation. And I feel we have created this “monster” customer due to the stores giving in to all their demands. If they don’t like something or feel they have been treated unfairly they call and complain and the stores give them free merchandise or money back. People know this and take advantage of it. If you look at someone the wrong way they report it to management. 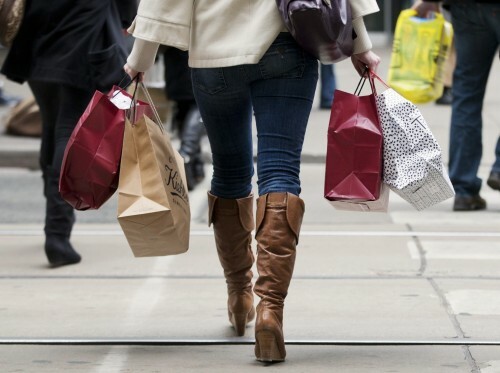 The consumer is all about getting something for nothing. I’m all for getting the best deal and looking out for myself as anyone that knows me knows this, but there is a line. And I think we have crossed it. It is always the same scenario every time I go shopping lately…I am happily looking at racks of tops or shelves full of beautiful shoes and out of the blue someone wants to see the exact top or shoe I am looking at. Ok, thats fine, I will just go to another aisle and look at handbags. No one is in this aisle. I start looking and immediately 4 other people come up and stand around me wanting to look at the exact same bag I am looking at. I must have great taste. Well I do, but that’s another story.. This happens every single time I go shopping, doesn’t mater where, what city or what store. I am used to this by now and used to the fact that no one says excuse me or sorry if I have to move out of “their” way. But my recent “bad” shopping experience tops all the others I have ever had and that’s saying a lot. I was in a store last weekend and happily looking at some soaps and items on a shelf, when all of a sudden I was surrounded by 3 women of various ages. I think maybe a mother and 2 daughters. I continued to look, I thought maybe if I ignored them they would go away. But that didn’t happen..This did..One of the women reached over top of my head and actually bumped me on the head to pick up something from the shelf. I couldn’t believe this even happened, not to mention no one said I’m sorry or excuse me or anything at all. I picked up my item and slammed my cart into theirs and said loudly, “I’m sorry, I’m evidently in “your” way. I’ll go!” I couldn’t help myself, it just came out. I was “mad as hell and not going to take it anymore”. To my amazement, they all looked shocked and one of them said sweetly and with an honest, sincere look on her face, “Oh, you’re not in our way.” Really.. So often I have had these encounters and when called out, people seemingly are oblivious about the fact they are doing these things. They truly look shocked and some do say, “oh, sorry”. It is as if everyone is in their own little world and that world is all that matters. You have to shock them back into reality and only then do they see what they are doing. I can’t be the only person to notice this and I hope it’s not because I’m getting old and remember a time when people were nice to each other. I also remember when a person smiled back at you if you smiled at them and most of the time, even said hello. So what is wrong with people? What happened to create this environment? And how do we go about changing this? What stories do you have to share? And don’t even get me started about angry, crazy drivers, that is for another day. Together on this roller coaster called life. 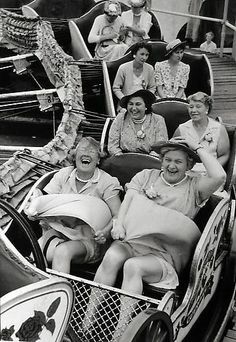 I just returned from my annual “Girlfriends Weekend” in Bethany Beach. We have been doing this for almost 20 years now and each one is special and never the same. While it is nice to visit the beach and get away, this weekend is always so much more than that. The annual event has taken on a life of its own. We have many rituals and then there is always something new that I take away from it and this year was no different. We all look forward to it so much all year long. A few times there may be someone who can’t make it and someone new who goes along. This was one of the years a few people didn’t make it. My best friend just moved away and wasn’t able to come as well as my 2 daughters who have been coming for quite awhile. I needed space to figure out what all of this change meant and the girls gave me that time alone. But they were there when I needed them. We have a great time together. We eat, we drink, we shop (boy, do we shop) but more than that, we talk. Intimate stories of our lives are shared and we are never afraid that this will be repeated. “What is said in Bethany, stays in Bethany”. All of us have gone through similar times, with the deaths of parents, divorces, family issues, children and grandchildren. We also talk of silly stuff and things I guess all women do, but we talk about things that matter to us. Someone will have gone through it and will have advice to give. We have shed a few tears over the years as well. One year in particular a friend couldn’t make the trip due to her Mother being very ill. We would call and text and send pictures so she felt as though she was there. At dinner one night she texted us that her Mother had passed. We made a toast to her and it was maybe the quietest dinner we ever had. Most of the time though, we are laughing as we share stories on body issues and menopause and other female things that come up in the conversations. Seems like we never get away without at least one of the never ending stories of someone’s poop problem (or lack thereof). On this recent trip I ran into one friend in the hallway and she had pulled up her shirt and was looking at her stomach. I stopped and asked her what she was doing. She said she had all these “things” on her body now. Skin tags, moles, sunspots, hard spots, you name it, with new ones coming on a daily basis. I was so happy!! I couldn’t believe it. I hugged her and told her I loved her and said, “thank you, I thought I was the only one that had these, you just made my day”. The support of this group of women is amazing. Most times you hear when women get together especially for a long period of time, they are gossipy, jealous and always trying to one up each other. Not these women. We support each other completely and know full well if needed, one if not all of them would be there. And so we all got up early Sunday morning to pack and hit the road for home once again. We hugged and made our annual promise to get together more than once a year. I don’t know if any of us will or not but I do know one thing..should I ever need anyone for anything, these women are there for me. This makes me wonder….I know men have get togethers. They go on golf, hunting, fishing trips together and I’m sure they have lots of fun. But do they share these kind of memories and stories with each other? I sure hope they do. Or not…. our trip to the Gettysburg Battlefield. My daughter and my 3 grandsons were visiting this week from VT. We decided to take the boys(12,10 and 7, keep these numbers in mind as it may explain some things) to the Gettysburg Battlefield. The oldest was studying the Civil War, and especially Gettysburg. So we decided to take them there, since believe it or not they had never done this while living in MD. You know how sometimes you really don’t get to the places closest to you. We both thought this would be extremely interesting for them. However, that couldn’t have been further from the truth. On the way there, I was sharing stories of my trips to the Battlefield and all of the knowledge I had picked up over the years. I really love going there and remember the first time I went in the fifth grade. I try to go at least once a year. It never gets old for me. I shared how many lives were lost over the three days the battle lasted and all of the souls I feel still exist there till this day and the fact that I can feel them. They thought that was gross.The oldest grandson shared some stories he had recently learned as well so I’m thinking wow, this will be a great experience for all of us. Imagine my surprise when the boys didn’t share my enthusiasm. The first clue came as we pulled up to the Peace Light. This is one of my all time favorites and so we decided to start the tour there. I was so excited for them to see it and experience the same feeling I get every time I go there. The excitement building in the pit of my stomach as we pulled in the parking space. I envisioned them all running up to it and asking me how it stays lit like that in this wind. The real scenario was a little different. The two oldest didn’t even want to get out of the car. “Why do we have to get out, we can see it from here”, really..that’s what we got. I made them get out and go up to look at it’s majesty. They reluctantly ran up, looked at it for a full second and ran back to the car. The 7 year old, my daughter and I explored. First fail. We took the entire tour and at every single monument I had the hopes that maybe they would start to see the “light” or get excited and want to get out and truly “see” one. Even the towers…what boy doesn’t love climbing up to the top of a tower and lean over and scare his Grandmother to death…evidently these boys. Again the 7 year old was out of the car and up the tower before I could open the door. I kept thinking in the back of my mind, wait till we get to Devils Den, they will love this. The view, the chance of falling off the rocks, the thrill of it all. So we finally pull up and once again they don’t want to get out. We made them go and as we start up the path to the top they say, “ok, its freezing, we’re going back to the car”. In all honesty, it was darn cold and very windy and cloudy which didn’t help. But these are the same boys that wear shorts all winter long to school everyday no matter what the temps. My daughter turned to me and laughed and said, “I have the car keys, they won’t be able to get in”. I smiled. We returned to the car to see two shivering boys standing there with a not so fun expression on their little frozen faces. 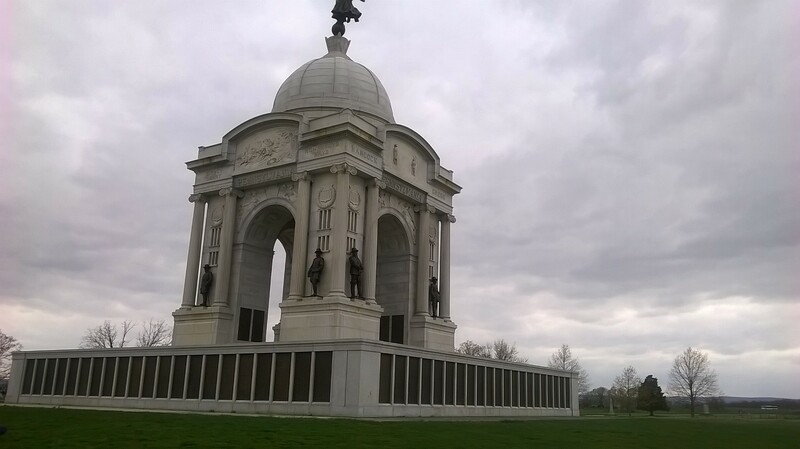 We made them get out one last time, at the Pennsylvania Memorial. I love this one too, another of my favorites. We told them it was the last one so they could make an effort. We all went up to the top and literally almost blew off. I was freezing but wouldn’t give them the satisfaction of knowing how cold I was. We saw Lincoln’s statue and read the Gettysburg Address and went back to the car and headed home. Later that night, I talked to the two older boys separately knowing I was going to write this and just wanted to get their real feelings on the trip. I said, we take them places all the time and we get the same reaction, it is a waste of our time and their time, so why should we bother. I asked both boys why they was so disinterested and wouldn’t get out of the car. To a word, they both told me they did really enjoy it. Each one said this as well…”Grammy, I was just cold.” I know one thing for sure the 7 year old really did. Not sure I’m buying the excuse from the other two, but they sure sounded sincere. I fear we are raising a generation of kids that have no interest in our past and how as a nation we got to the place where we are today. They would rather stay home and play video games than visit a historic site. This makes me sad. What do you think? Let me be the first to say I love social media! I really do! Catching up with friends and family members, and seeing all the pictures of the fun things they are doing. This is great and I think what it is truly all about and one of the main reasons I myself do it. What I don’t like is all the negative stuff that comes with it. There are certain posts I don’t even look at due to the fact I know what the comments will be like. I scroll by those things just like I tell others to do. But what if it happens on your own page, your own posts? A friend, who by the way is the sweetest person anyone could ever hope to meet, recently had to take down a post on Facebook. She had innocently put something up she thought would be thought provoking and wanted to see what others would think. It got nasty very quickly causing her to take the post down altogether. What is that? Why do people do this? Is it the fact no one can see them or they have no voice in the real world so they use it more online? I don’t know the answer to this. I guess I am from a different era, one where we respected others opinions whether we agreed with them or not. Why can’t we just have an opinion and not attack others for their’s. I am constantly saddened by this and it always makes me wonder why this has to happen. I do have a theory about why it happens… I think the news outlets are the biggest contributors of this and it escalates from there. They stir the pot. Back in the day, the news anchors would tell a story, most often with no emotion and no opinion. It amazed me how they could do this. But now we know how they feel and where they stand the moment they put it out there. Also once the story is told, we see it over and over and over again. There is even name given for each story. We see all of those related to it and how they impacted the story. The victim is forgotten, it is all about the one who committed the crime. It glorifies the perpetrator and the negativity. Don’t even get me started on the political posts and comments… I never read or comment on this and really, I don’t want know how people feel about politics and candidates. Especially the people close to me. I think it is better that way. My Dad always believed you don’t talk about politics or religion.And I think that holds true here. I don’t want to know who they want for president or how they feel about the one we have. We as a nation have never been so biased and divided. What is with all the name calling and lack of respect, not just for the man, but the office? Where did all of this hatred come from? And I am not just talking about the current one. It started way before this. My point to this is, all this negativity is not good for us, not just as a nation but us as human beings. Negativity impacts our health, it affects your mood which affects your brain and total overall well being. Everyone is so quick to react to any situation that comes up and usually not in a good way. Take a minute to breathe before you react. So, my personal quest these days is to try and find the good in every situation. I would love to see more good stories on the news and on social media. I try to do this everyday and challenge others to do it as well. Let’s stop all the negativity and truly “give peace a chance”. I challenge everyone to try this, just one small change can have a huge impact. Apple Cider Vinegar, The Best Thing Ever..
1. It is antimicrobial, so it kills bacteria. Kills germs and helps with sore throats, and flu. 2. It is an anti-inflammatory, eases pain and reduces swelling. Helps with joint pain, leg cramps, any issues with arthritis and other joint problems. 3.Reduces your blood sugar level. (please talk to your doctor first before taking it). 4. Gives you energy and is a mood booster. 5. Aids in digestion, helps with both constipation and diarrhea. Don’t ask me how it helps with both of these, but it does. Helps with any other bowel issues and acid reflux.I have heard it can help with weight loss, only because it can make you feel less hungry. It does have this effect on some and helps them lose a few pounds. 6. Helps with skin issues and scalp problems. Acne, itchy skin, poison and dandruff to mention a few. This list is just a few of the things I personally can attest to it helping with as far as me and my family. My grandkids used to get sick every winter, bringing home all kinds of germs and flu from school. I can honestly say, they have not been sick this winter. Their mother puts a teaspoon of it in their juice everyday and they don’t even notice it. As for me, I make up a bottle of water at the beginning of the day with 2-3 tablespoons of ACV and the rest water. If I have a special need like say I feel a sore throat coming on, I take it straight. 2 Tablespoons first thing in the morning, rinse my mouth with warm water because it can have an adverse effect on your enamel, and follow it with glass of warm water before eating or drinking anything. If you feel you can’t stomach is like this then add a teaspoon or two of honey to taste. Update: I now take two tablespoons every morning straight..drink some water first, then the vinegar and then some more water. I love the taste of it now. I have done this for a few years now and sometimes I forget for a while until I have an issue like I did this week. I had an incredibly stiff neck. I have been working on the computer for extended periods of time and I was in excruciating pain. It actually woke me up at night, i tried switching pillows, one pillow, two pillows, no pillow..nothing worked. If you know me you know I don’t like to take drugs, even aspirin or ibuprofen. If I have to I will as a last resort. I took a few this week. But on Sunday night after waking up numerous times due to the pain, I knew I had to do something or go to the doctor, which is another thing I really don’t like to do. So immediately after I got up on Monday I took 2 Tablespoons straight. I then did something I had never done before, I put some straight out of the bottle on a paper towel and rubbed it all over my neck, back of my head and upper back. It is not an exaggeration when I say within a half hour I could move my neck all around without any pain. And the best part is it stayed this way all day. I did it again before bed and again every morning since. The pain is gone. Now please realize, this is my story and what has happened to me. This is in no way a medical site or am I giving medical advice. If you have a serious health issue and want to try ACV please talk to your doctor first. 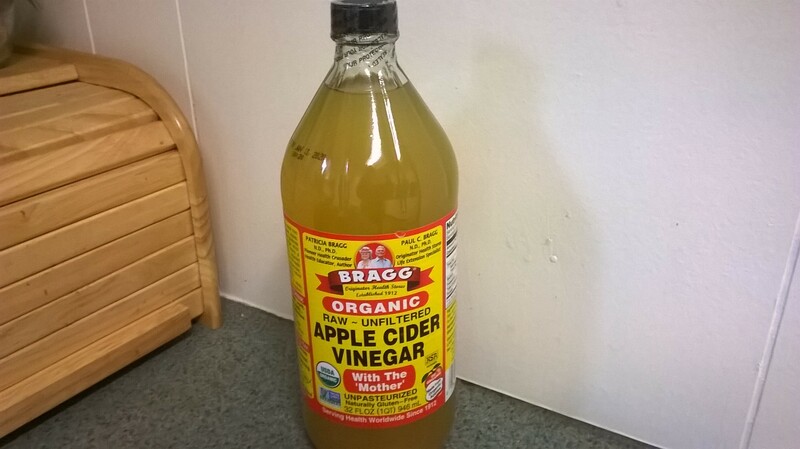 The best apple cider vinegar should be organic, unfiltered and not pasteurized. It should have “the Mother” still intact. You will see pieces of apple and what looks like strings in the bottle.The brand I use is Bragg Apple Cider Vinegar. Best of luck to you and be healthy! Well no I’m not, but a lot of people are these days. I hear this expression all the time, at least once a day. Most of the time it is coming from kids. Kids in stores with their Mom’s, they want to be anywhere but there. Kids at family gatherings and they don’t have their iPads or a tv to keep them busy. I get it, they are so used to playing their games or sitting in front of a box all day watching some show that makes absolutely no sense whatsoever, they can’t function without the constant stimulation of a screen of some sort. I recently saw a commercial for an aquarium and the kid is asking his Dad how they got the graphics so real on the screen, while in reality he is looking into the tank at the aquarium. This all makes me sad. I was never once bored as a child. Never! I was outside from the minute I woke up until it got dark and my parents yelled for me to come inside. We rode our bikes, jumped rope, played games and used our imagination. Now I know not all kids are bored and looking for someone or something to entertain them. My own grandkids are full of imagination and are outside all the time. Although, I have heard them say they were bored once in awhile. Their parents quickly gave them something to do to take care of their so called boredom. And it wasn’t always something they would want to do. What really is astounding is to hear this from adults. I am constantly amazed when I hear this coming from them. How can one be bored? There is so much to do and see in this world. It just boggles my mind that someone could ever be bored. I can honestly say I have never uttered those words. I have been off work now for two months and not once have I even been close to being bored. There aren’t enough hours in the day for me. So my advice for those who “are” bored is simple. Go outdoors and bask in the beauty of Mother Nature. Go for a walk. Write someone a letter, on paper, with a pen. You remember those, right? Volunteer at a food bank or pet rescue. Call a friend or relative you haven’t talked to in some time and catch up with what is going on with them. Or just get lost in a good book. Learn something new, do something you have always wanted to do. That is what I’m doing with my writing. I have always wanted to do this and now I am. It doesn’t matter what comes from this, I am doing it for me. I am enjoying it so much. It isn’t always easy but believe me, I am not bored. No this isn’t a personal ad!! Then in high school it was a coat. Not just “a” coat, a Chesterfield Coat. It took forever to find just the right one. Mom was just about done with me when we finally found it! It was black and white tweed with a black velvet collar. Success! High school was also officially the beginning of my obsession with shoes. It started with a pair of Capezio shoes. I had to have them, everyone did but me. My parents wouldn’t get them for me since the were very expensive. I had to babysit to earn the money and buy them myself. I finally did…Twin button, black leather Capezios. I had a few other pairs after that, but none of them could compare with those very first ones I got with my own hard earned money. I still remember how they smelled and they way they conformed to my feet. I loved those shoes..they were perfect! i don’t think I have ever found a pair that I loved as much as these shoes. It still remains, the shoe thing, only now I have added a “boot thing” to it. 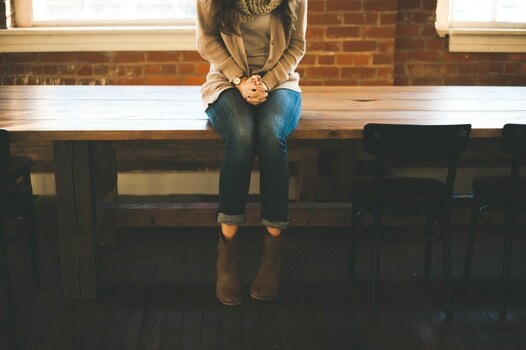 Just recently I was “in search of” the perfect pair of brown boots. Not just brown, mind you, I wanted cognac. You see I already had brown ones. I also had brown cowboy boots. But neither of them were the right shade of brown I was looking for. I searched for months, online and in stores when I was in the malls for work. I finally found them! They were on sale and the last pair, the ones on the display. It was meant to be. The perfect color I had been looking for. I have yet to wear them, but I have the color I need, if I do. Don’t get me started on purses. I am in constant search of the perfect purse. There are things I want and need in a purse and can never find the exact one I am looking for. I need a certain amount of pockets. I need it to feel a certain way, smell a certain way(I know, I know) and hang a certain way on my arm or shoulder. Somehow I can never find all of these things wrapped up into one bag. I have been in search of a turquoise colored bag since last summer. It had to be the perfect shade of blue and I never found it. I was bound and determined to find it this year and I finally did. it just came yesterday and it is the perfect shade, just what I had been looking for. I can’t wait to start using it. Clothes…I wore leggings to my recent job. I was constantly bending while merchandising the cases and they seemed to work well for me. We had to wear black for work and so I was in constant search of the perfect black leggings. They were either to short, too long, too saggy, too tight…you get the picture. I was cleaning out my closet last week and counted 15 pairs of leggings..black leggings. So yes, “Houston, we have a problem”. I am aware of it. I know I have a problem. Clothes, purses, shoes, boots, makeup…Oh yeah, makeup. There “is” one thing I have been in search of my whole life and have yet to find… It is the perfect lipstick. Not just the right color, the right texture and consistency too! I found a few over the years but sadly they were discontinued…of course. So I am still “In search of” the perfect one. I am not sure what all of this says about me, as a matter of fact, I don’t even want to know..or care. I guess I will always be “in search of” something and that’s ok.
What are you “in search of”? 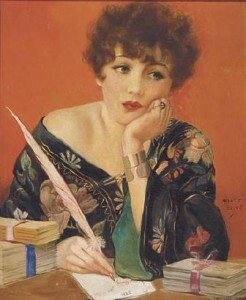 This is what I wish I looked like while writing…as I sit here in my sweats and slippers..